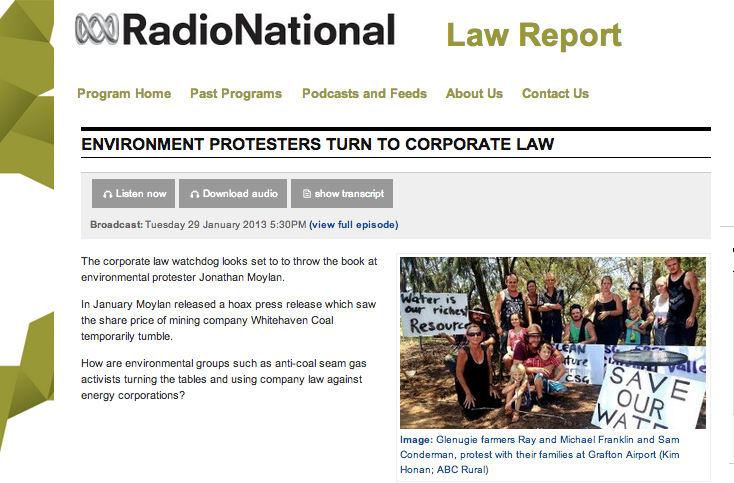 The corporate law watchdog looks set to to throw the book at environmental protester Jonathan Moylan. In January Moylan released a hoax press release which saw the share price of mining company Whitehaven Coal temporarily tumble. How are environmental groups such as anti-coal seam gas activists turning the tables and using company law against energy corporations? Damien Carrick: Hello, welcome to the Law Report, I am Damien Carrick. Welcome to the first of our new programs for 2013. Today, environmental activists and the Corporations Law. Right now the people of northern New South Wales and south and central Queensland are battling floods, and we’re seeing people in these communities come together and work incredibly hard to help those hardest hit. Today we’re looking at an issue that divides many of these communities, especially in northern New South Wales. The issue: coal seam gas. As you may have heard, ASIC looks set to throw the book at hoaxer Jonathan Moylan over his fake press release which saw the share price of Whitehaven Coal temporarily tumble. But can environmental groups turn the tables and use company law against energy corporations? It’s a strategy being used by anti coal seam gas activists in northern New South Wales. Announcer: The volatile coal seam gas issue on the mid-north coast suddenly erupted. Right squad police cleared protesters from the road outside the Glenugie property at the centre of a 47-day blockade. Metgasco has been trying for that long to conduct exploratory drilling on the site, land owners and their supporters just as determined to block the arrival of the company’s trucks and drilling equipment. Damien Carrick: At this recent altercation at Glenugie, some of the protesters chained themselves to the farm gate. Others attached themselves to the underside of a company truck with a bicycle lock. But anti coal seam gas activists are not focusing all their efforts on traditional style protests. Aidan Ricketts is an environmental activist and lawyer. He says anti-CSG campaigners are using the Corporations Law to fight Metgasco. Aidan Ricketts: Metgasco is basically a coal seam gas company operating in the Northern Rivers, and as far as we know the only available reserves of gas they have are in the Northern Rivers. The residents of the Northern Rivers are resolutely against coal seam gas development. We’re not dealing with a small protest movement here, we are dealing with a massive virtual social consensus against this industry. So there’s a palpable sense of failure of democracy in the Northern Rivers, and I think people are kind of aghast at seeing this industry imposed on them by force by virtue of the State government, the riot squad. Damien Carrick: In brief terms, what form has the campaign taken? I understand that there was a recent blockade at a place called Glenugie. Aidan Ricketts: Certainly the community and the CSG-free Northern Rivers movement is committed to nonviolent action, and as frustrated as the community is, it’s been doing its level best to direct that into nonviolent means. The point to make in all that of course is that the social movement mobilises the public at times but it doesn’t have control of the public. So as much as it tries to train people in nonviolent principles, as much as it has people out there doing de-escalation work at all public events, there’s a few in every crowd that sometimes cause problems. Damien Carrick: Let’s come back to that in a moment. Of course in recent weeks there has been a lot of discussion about using the Corporations Law against hoaxer Jonathan Moylan over the Whitehaven Coal hoax. But your campaign against CSG in northern New South Wales is seeking to use these same laws as a weapon against Metgasco. You have a number of legal arguments, two I believe. One revolves around what you describe as a failure to disclose social movement risk. What do you mean by that? Aidan Ricketts: Okay, well, there’s a continuous disclosure duty on listed companies to disclose any information they have that they’d expect to have a material effect on the price of their shares effectively, of their securities. Now, normally that relates to financial matters, takeovers and so on, but in relation particularly to oil and gas companies, they have some additional reporting requirements under chapter five of the ASX rules and also what is called the JORC guidelines, which tend to mean that oil and gas companies do a lot of reporting to the sharemarket on operational matters such as the progress of drilling and so on, and indeed Metgasco has a long history of reporting on the progress of drilling. So what we’re arguing is that that sort of report on progress should certainly be transparent and inform investors of both progress and delays, and certainly whilst for all companies it wouldn’t be normal to report on protest activity and so on, I think what we’re arguing is that there comes a point in time where the sheer scale of social movement opposition to a particular company and its operations becomes an obviously material investment risk that the company really should be fronting up to shareholders and being transparent about. Damien Carrick: I believe a Metgasco shareholder has lodged a complaint with ASIC along these lines. Aidan Ricketts: Yes, we did have a shareholder contact us at one stage expressing their dissatisfaction that when they bought shares they didn’t hear anything about this, and, as they’ve looked since, they’ve seen just how incredibly embattled Metgasco is. Damien Carrick: Aidan Ricketts, is this person a real investor or an environmental activist? Is this person genuinely concerned about investor rights or simply using that persona that had to cause difficulties for the company? Aidan Ricketts: Look, I don’t know this person but as far as I know they are a businessman in the area. Look, this question about whether somebody is a real resident or a real community member or investor or did they become an environmentalist I think is a bit of a furphy and we are facing this constantly in the media here where you’ve got 87% of the community against this, and that’s going to include police, businessmen, real estate agents, investors, all sorts of people. And there’s this kind of silliness where once somebody outs themselves as being against coal seam gas they suddenly get labelled a protest or an environmentalist. I think we need to lose that label and just realise these are people in the region who oppose the industry. Damien Carrick: Indeed. Just last Thursday Metgasco did release a statement which referred very specifically to opposition to its operations in the region. Surely that addresses any disclosure issue? Aidan Ricketts: I think that’s a breakthrough. We’ve been arguing this for a while, that it’s something that should be disclosed. Even given that particular disclosure, it’s still expressed in fairly euphemistic terms. Damien Carrick: Metgasco are out in the media, they’re not hiding anything, they are participating in debates, including this one on Radio National, they’re not shying away from what’s taking place. Aidan Ricketts: They certainly do participate in debates, but I think what we’ve noticed is there’s a very big difference between what’s going into the public media in the Northern Rivers and what investors in other regions who may be in London or Perth or Sydney or where-else might actually be having access to. So certainly what we’ve noticed is there’s a big difference between what Metgasco has to say to the local media and what they have to say to the market. Damien Carrick: As well as your complaint about failure to disclose social movement risk, opponents of Metgasco, members of your group I understand are planning to lodge a very specific complaint with ASIC, and it involves the same breach of the Act levelled at hoaxer Jonathan Moylan. What are you alleging exactly? Damien Carrick: What’s spudding a hole? Damien Carrick: In a press release. Aidan Ricketts: Yes, in an ASX release. And some eyewitnesses there claimed that that operation went horribly wrong and that that hole had to be abandoned ultimately and that two new holes needed to be dug eventually and it was only on the third hole they were digging that it was successful later on Saturday. So what they are alleging is that really that release saying it had been spudded the night before was premature, and if that’s so it could potentially be a breach of that section of the Act. Now, my position on that is it’s not for me to come out and say that was misleading, it’s something for the regulator or the courts to decide as a result of a complaint. Damien Carrick: Well, Metgasco deny that this was a breach. If I understand correctly their argument is because the press release is around the starting of the spudding not the completion of it. But even if there was a breach, many people listening to this would say it doesn’t sound like a substantial breach, it just sounds like a minor technical infraction if they made an announcement about something taking place on one day and it was completed on the next day. Aidan Ricketts: Yes, I’m sure people could say that’s purely technical. I’m not sure that’s how the regulator would see it. Under the corporations legislation there are quite high duties of diligence on company officers to get these things right. If it turns out that they put out a release that wasn’t quite right, then I think even if it’s technical…that might go to what kind of responses the regulator might have, but I think even a technical foul is something that no company would want to be found to have made. Damien Carrick: Well, I guess Metgasco would find it ironic that activists like yourself would be looking at the black-letter law when in fact they would say there are lots of breaches of the law by activists who are against their operations. They would say that the blockades are clearly in breach of some laws. They talk about an assault which just occurred a week or so ago, general intimidation against workers, death threats. Aidan Ricketts: Okay, there’s two issues there. One issue is the actual activities of an organised protest movement which involves holding protests, holding blockades, and in those blockades some individuals do choose to place themselves in arrestable situations where they might lock themselves into metal devices on gates or buried in the road or put themselves in tripods. That’s a time-honoured tradition of civil disobedience and the common law has a long tradition of recognising that at times citizens will take political action that’s technically unlawful in the sense of being an act of disobedience and they’ll face the courts and be processed according to law, and that’s what happens. And the rest of the people at the blockade through police liaison confer with the police and say, well, where can we stand and just watch the proceedings. So that’s quite ordinary, and citizens have this…it’s like the Nuremberg principle really, citizens have this time-honoured capacity to make a political statement that’s technically in breach of the law and, as we say, they have the right to be arrested and processed according to the law for that. What the movement as a nonviolent movement has been doing is conducting nonviolence training at multiple sites over many months, aiming to create a critical mass of people who really understand how nonviolence works and conduct themselves well, and I think we saw that at Glenugie. We had many, many people moved along by the police, but the people reacted in quite a sophisticated way. But there’s no way when you’ve got this incredible grief at having it imposed on the community by force that a nonviolent social movement is able to reach everybody out in the community, sometimes that community anger does spill out in unfortunate ways. It’s easy for Metgasco to blame the movement for that but I actually think the movement is responsible for keeping that minimised as much as possible. 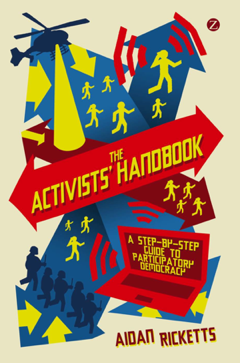 Damien Carrick: Aidan Ricketts, an environmental activist, a lawyer and an academic who runs a university accredited course on public interest advocacy. Peter Henderson is the managing director and CEO of Metgasco. He says Metgasco has heard nothing from ASIC about any complaint by a shareholder, and so he says the company’s recent briefing which referred to delays due to ‘rig availability, approvals and some protests’ is not connected to any such complaint. Peter Henderson: No, it’s not, we’ve had no communication from ASIC. From our point of view we’ve observed all the appropriate listing and reporting rules and we’ve heard nothing from ASIC. Damien Carrick: So do you think that this significant social movement activity is something that should be reported? Peter Henderson: No, not at all, it comes back to whether it’s having a material impact on our business or not. It’s no secret to the general community that there are people around Australia and around the world and in the Northern Rivers region who have their concerns about fossil fuels and in particular don’t like fracking, that’s common knowledge. There has been loads of press reports over recent weeks about dissent in some areas of the Northern Rivers region, and we’ve had protests. No secret there, it’s common knowledge, and it has had a little impact on our business in terms of schedules and costs, but our business by its very nature has uncertainty about it, and when we drill a well we know a lot of factors can affect the drilling such as weather, the reliability of equipment, slow drilling practice, lack of equipment arriving, there’s a whole range of reasons which can determine the rate at which we drill and how much the cost of the well is. And if we had to report every time we didn’t run absolutely perfectly to our budget we’d have ASX reporting every day of the week. So we have had an effect due to protests in terms of costs and schedule, but they have been no more significant than other factors, and it certainly hasn’t been of sufficient materiality that there has been any reason to report it to the market. Damien Carrick: The other argument put forward by Aidan Ricketts is that there are questions around whether or not Metgasco has made a misleading statement. The idea is that a Metgasco ASX announcement on Friday 11 January, which claimed to have spudded a well, but an eyewitness said that the spudding was not in fact completed on 10 January, I think it was in fact completed on 12 January, and this therefore is a misleading statement according to the Corporations Law. Peter Henderson: Well, that’s completely incorrect. I just went in, for interest, and looked at a small dictionary of petroleum industry words and phrases and it defines ‘spudding’ as ‘to start drilling a well’, and it’s exactly what we did, we started drilling the well. In fact if we wanted to be pedantic about it we could argue we had the surface casing in some weeks beforehand and could have used that, but no, we started and put the rig up and put the drill bit down the well and started drilling on the day and that’s what we reported. We didn’t go drilling as fast as we would have liked and we had some mechanical problems, but we were drilling and that fits in exactly to the definition. So that report simply doesn’t make any sense whatsoever. It’s interesting, before you asked about a protest or social movement, and I think I answered just the protesting side of things. There are certainly groups of people in the Northern Rivers region who don’t support coal seam gas, but we’ve been in the area now for 10 years or so and we’ve drilled something like 50 wells, we’ve had 300 different agreements with landholders, we enjoy the support from the people we work with. And we believe our Casino community, and that’s the community we work with…the Richmond Valley Council which is based in Casino has come out very strongly in support of the industry, recognising it’s a state government industry but it’s got value to add, and that was in statement before Christmas. So we believe we’ve got the support of the community and we can continue, and the very fact that we’ve virtually finished this well now and about to move another is a demonstration of that. Damien Carrick: What’s your view of anti-CSG activists using corporate law frameworks in its fight to stop the development of the industry in northern New South Wales? Peter Henderson: I’d like to throw the law back at them in a sense, I think they’re being rather cute in this approach and I don’t think they’ve got a leg to stand on whatsoever. However, these are people who actually repeatedly ask people to break the law. We are a company that has government approval to do our work, there’s no question about that, we followed all procedures, the government has come out very strongly in our favour, saying we’re going ahead. But these are people who are…I can read out a list of laws they’re breaking. They are people who are trespassing, damaging equipment, interfering with the rights of us getting on site, which is in breach of section 136 of the Petroleum Onshore Act, they are putting people’s lives at risk or their safety at risk, they’re interfering with the farmers getting to the basic land, they are people who are intimidating our employees by following them and tailgating them home. We’ve had death threats, we’ve had bomb hoaxes, we had an assault of a policeman and a security guard the other day. So I find it’s amazing that the anti coal seam gas group would be resorting to Corporations Act type issues when they are promoting breaches of the law in so many areas. Damien Carrick: People like Aidan Ricketts would say, look, there is a lot of genuine anger out in the community, and in fact his job is to actually de-escalate that anger and try and avoid these issues which may be inherent in a very, very hot and contested issue like this one. Peter Henderson: Damien, I find that, again, an amazing statement. ‘De-escalate’? Where is the escalation coming from? When people talk about this thing, coal seam gas being the biggest threat sense the Second World War and this is a war, this is a barricade, to me they are fighting words, they’re the words which say to people ‘you’ve got the right to take the law into your own hands, you’ve got the right to be a vigilante, if you don’t agree with something you have the right to break the law’. That is not a peaceful protest. We don’t think there’s any room for people just deciding that they’re above the law and they can break it simply because they disagree. Just think where the world would be, where our society would be if everyone who felt that they hadn’t won the argument could get up and break the law. Damien Carrick: There has been a lot of social change achieved by civil disobedience and protesters though, hasn’t there? Peter Henderson: You could argue, and the example I’ve heard is Gandhi and the other one is Martin Luther King. I don’t think they are at any way parallel to the industry we work in. There’s a huge difference between standing on the side of a road in a protest march, writing letters, putting arguments together and actually impeding people’s progress, damaging equipment, intimidating people, bomb hoaxes and so forth. There is a fundamental difference. Damien Carrick: Would you acknowledge that, say, the Franklin Dam protests, which involved all sorts of blockades and what have you back in the 1980s, that did lead to a good outcome? Peter Henderson: And that’s a long, long time ago after…I think I was probably in university in those days and I was probably well and truly behind it and I can’t recall the different tools and things which were used at that time for that purpose, so I have to pass that one. Mind you, at that stage I would have been quite a strong supporter of it I expect. Damien Carrick: Peter Henderson, thank you very much for speaking to the Law Report. I’m Damien Carrick and this is the Law Report on Radio National, Radio Australia and ABC News Radio. Senior lecturer Marina Nehme teaches corporate law at the University of Western Sydney. I asked her what she makes of the argument that Metgasco could be in breach of its corporate disclosure obligations if it fails to inform the market of significant social movement risk. Marina Nehme: Well, they will need to report it to shareholders if it can be proven that this information will impact the price of the shares, so a reasonable person will believe that it is pertinent information when they want to buy or sell their shares. If that is the case then, yes, that information needs to be disclosed. But if it’s not the case then, no, they don’t need to disclose it. Damien Carrick: If they talk in public about the problems that they are facing and the protests that are against their exploration program, is that enough, or do they actually have to report it as such to the ASX? Marina Nehme: That may actually be enough because the information is generally available to the public, so anyone can actually access it, so it’s not information that they are trying to hide. Damien Carrick: I understand that there was a market briefing on January 24 by Metgasco and they acknowledged, I think for the first time, that there are delays due to, among other things, protest actions. Would that acknowledgement go some way or a long way to addressing any of the potential problems for the company that might arise from nondisclosure, as suggested by activist Aidan Ricketts? Marina Nehme: Yes, because they have disclosed it to the public. So it’s no longer information that is not generally available, it is available to the public. People who read the release know about it, people who read the media release know about it. Damien Carrick: Activist Aidan Ricketts has another argument around corporate governance. He says that there was a Metgasco ASX announcement on Friday 11 January which claimed that the company had spudded a hole, but an eyewitness says that the spudding was not completed until 12 January. Aidan Ricketts says this is a misleading statement in breach of the Corporations Act. From what you know, do you regard this as a significant breach that would be of interest to ASIC? Marina Nehme: If that is correct then, yes, that would be a significant breach because the corporation is not supposed to disclose information that is false to the market, and so if they did that they may actually be in breach of their continuous disclosure obligation, and they may also be in breach of misleading and deceptive conduct regarding financial services. Damien Carrick: In terms of the way ASIC would regard any such breach, if in fact it did occur, does it depend on how important it was to the market, whether or not it affected the share price, or is it some kind of more black and white test about just information being out there? Marina Nehme: The thing is with continuous disclosure cases they are very tricky because to prove that continuous disclosure has been breached is very hard in the first place. So as a result, when ASIC is dealing with these cases it’s going to assess if the element of the provisions have been met. If ASIC believes that they have been met, then ASIC would be taking action regarding this, and it has done that in the past with the James Hardie case and the Fortescue case. Damien Carrick: Marina Nehme from the University of Western Sydney. ASIC was indeed successful in its action against James Hardie, but unsuccessful against Fortescue. Of course when it comes to allegations of misleading statements, ASIC’s next target is likely to be anti coal mine activist, hoaxer Jonathan Moylan. Ben Knight: [7.30, ABC TV] It will be remembered as one of Australia’s most famous corporate hoaxes. Two days ago anti-coal activist Jonathan Moylan knocked up a fake press release from the ANZ Bank which said the bank was cancelling a billion dollar loan to Whitehaven Coal for its new mining project because the bank was worried about the impact on the environment. Jonathan Moylan: I certainly didn’t intend any harm to shareholders in Whitehaven and, you know, for the record I do apologise. But I won’t apologise for exposing ANZ’s dirty investments in Whitehaven Coal. Damien Carrick: Aidan Ricketts, what’s your view of the actions of the activist Jonathan Moylan? Aidan Ricketts: Firstly I’d probably query…as a lawyer I’d be very cautious about the issue of causation and say, well, Jonathan Moylan issued a hoax or satirical release and then there was a take-up of that release by journalists, financial journalists and probably stockbrokers and financial advisers who have quite high duties of diligence that they maybe didn’t live up to on that particular day. So I think there’s quite a few people in the chain of causation that leads to those losses. It might have been started by that press release but certainly there’s a few other people who have got something to answer for and it is little bit too easy to dump that all on Jonathan Moylan. Damien Carrick: But it was the goal of Jonathan Moylan to achieve what he achieved. You’d have to acknowledge that. Aidan Ricketts: I’m not entirely sure that it was his goal to cause those losses. I think his goal was to reveal to the public by way of a cheeky political satire that ANZ was invested in the Whitehaven mine, and indeed that’s the enduring story that’s come out as a result of it, and ANZ is now under a fair bit of pressure over that investment. Damien Carrick: But the press release was successful, and therefore he got the publicity, and that was what he was aiming to do. Aidan Ricketts: Sure, that part of it was successful, and I’m sure it was that publicity about ANZ’s investment that he was aiming for. Damien Carrick: And we’re now being told that there have been investors who have suffered as a result of that hoax. Is that legitimate protest when it would appear mum-and-dad shareholders get caught up in that kind of hoax? Aidan Ricketts: That’s certainly not something I’m involved in or certainly the CSG-free Northern Rivers movement are involved in. We are, as you can see, pushing for investor transparency across the board, and we think that that is certainly a noble aim. I think Jonathan Moylan’s action is at the risky and controversial end of something that arranges really between hoax and political satire. I compare it to the way in which the Chaser crew reveal security problems at the APEC summit with their cheeky action, and we’ve seen a number of other cheeky actions by other groups around the world that aim to reveal these things. Damien Carrick: But maybe the Chaser action…that was against the State. This had a direct monetary effect on individual investors as opposed to simply making the State look ridiculous. Aidan Ricketts: Yes, that’s right, and I think that’s a risk factor that somebody who is considering that stuff certainly has to weigh up, and having seen what happened people might weigh that up a lot more carefully, I know I certainly would. And given that Jonathan might be prosecuted for this, I would certainly be cautious to make any statement that that was his intention. I think it’s fairly clear his intention was to publicise ANZ’s investment. I’m not sure he expected to be taken so seriously by financial analysts. Damien Carrick: I guess corporate law experts would argue intention or motive is not important. If you actually start messing with markets, that’s serious because it can have serious consequences for confidence in the markets which have wide flowing effects beyond the particular hoax. Aidan Ricketts: Look, I’m sure they would, and that’s certainly the case, which is why our point of departure is just argue for transparency about what’s really going on, you know, both sides the story. Damien Carrick: Well, I think it’s interesting because on one hand you would support or call for understanding of Jonathan Moylan breaching corporations laws to serve an environmental end, and at the same time rely on those laws to achieve an environmental end with respect to your conflict with Metgasco. Aidan Ricketts: Well, I mean, listed companies and their officers have specific duties of diligence to make these disclosures, so they are in a slightly different category to somebody like Jonathan Moylan, and I’m not defending his actions, saying it was good or that there should be more of it. My only caution really is I’m not going to come out and say that I can speak for what his intention was or can speak to the issue of causation of loss. Damien Carrick: And like Aidan Ricketts, corporate law expert Marina Nehme thinks the Jonathan Moylan hoax is a clear-cut contravention of the law. Marina Nehme: Yes, the conduct is in breach of the Corporations Act because it was misleading, and if you were a shareholder at that time that heard the news and sold their shares as a result of that, the shareholder has suffered a loss, so it’s not really a victimless crime. There are some people who did sell their shares at that time and they did lose money as a result of that, and it’s a very serious breach of the law because we need to make sure that our markets are efficient and people have confidence in them. So these conducts should not really be allowed. Damien Carrick: What about the idea that this is some kind of protest action, it’s civil disobedience, it’s an attempt to bring attention to a wider environmental issue as opposed to actually…that’s the primary motivation. The primary motivation is not to cause harm to individual shareholders. Does that make a difference? Marina Nehme: Not really. Even though the conduct of Moylan may be viewed as admirable, but it did breach the law, and as a result of that should it be excused just because he had a good intention? And the answer is no, not necessarily. Mum-and-dad investors will not know if they are investing based on correct information or bad information, and as a result of that they may not want to invest anymore. Damien Carrick: Marina Nehme, senior lecturer at the University of Western Sydney. That’s the Law Report this week. Thanks to producer James Paterson and to audio engineer Kerry Dell. Investors in industries that substantially raise global emissions need to acknowledge that global pressure on the planet has reached the point where action is required…NOW. Peer-reviewed cientific reports state clearly that climate change is upon us. Recent weather disasters around the world have gained the attention of world leaders. If all fossil fuel use was to cease today we are STILL going to face changes in our climate so why wait any longer? Communities attached to their local surroundings will not sit back and allow shareholders from hundreds or thousands of kilometres away, with no deep connection to that area, to dictate that the Northern Rivers may be trashed to raise a quick buck. No CSG! Henderson sais that the “protesters” think they are above the law, yet, the csg industry has systomatically raised themselves above council laws and regulations, and environmental and fire protection laws. Thank-you for relaying this report. There are two points I wish to make. The first leads in to the second. First, as suggested by the article title, much here is in reference to the law. I take a step back and ask: what is it? What is the law? Is it not an expression of the will of mass society? An alternative may be that it is an expression of/from a divine being. The latter does not seem to be the case in this article. In relation to such an alternative: What is being dealt with here (i.e. in publicly asking this question) is how society (comprising of unique people) can manage itself. I, for one, cannot see how that can be done with reference to something which even theological schools of thought contend cannot be fathomed by one person. As a working definition then, isn’t the law – as stated – the expression of the will of mass society? Each of us not only has a right to influence it with changes in time, each of us has a responsibility to do so. With any and indeed all laws. Bear with me one paragraph. Oil was first drilled for (purposely) in the northern part of the United States of America in 1859. The 1800s saw the rise of the Industrial Revolution and systematic excavation of fossil fuels around the world. At that time, the world population was far smaller and demands on world resources was at a rate that seemed like those demands could continue indefinitely. Since then, the relationship of humans to the planet – which keeps us all alive – has changed. One could say that the planet is now full. Full of people and, more specifically, full of our material possessions. These, incidentally, do not add to health, life enjoyment, an inner sense of peace etc. Rates of depression, isolation etc. are (from what professionals have told me) increasing – especially since WWII. Summing up the first point, parliamentarians, civil servants, judges are not only drawn from general society, they are employed and paid to enact and then maintain the general will of society. For practical, logistical reasons alone, society is not able to do the writing of laws and then maintain them. Talk of “the law” without having some appreciation for what it is…. well… what does it lead to? Danger? Outcomes which treat each person as an equal? Outcomes which treat each person according to his/her employment position? This is being submitted here in an attempt to provide some perspective. Second, more to you Mr. Ricketts, this is something which I (for one) haven’t really seen come out in the story above or your book (which I have purchased and read sections from). I do not have legal training. That may be a plus or a minus – I’ll leave it for you and others to assess. Being an officer of the court is different to being an activist. Both of those are different to advising activists how they might approach their activism. Perhaps you may be able to relay to me (tom.369@hotmail.com) what broader perspective it is which you are bringing (or at least attempting to bring) to society? One thing I know for sure: I do not know everything. In fact, in this case (i.e. your case), I know next to nothing. Thank-you reader for your time.